Planning the perfect seaside break? Then you need a hotel with a sea view too! 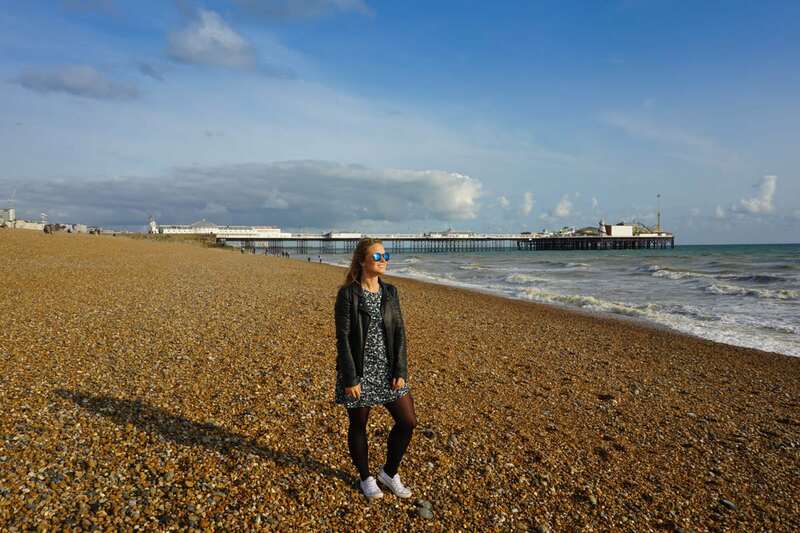 Plan your little getaway with my guide to the best hotels on Brighton seafront. 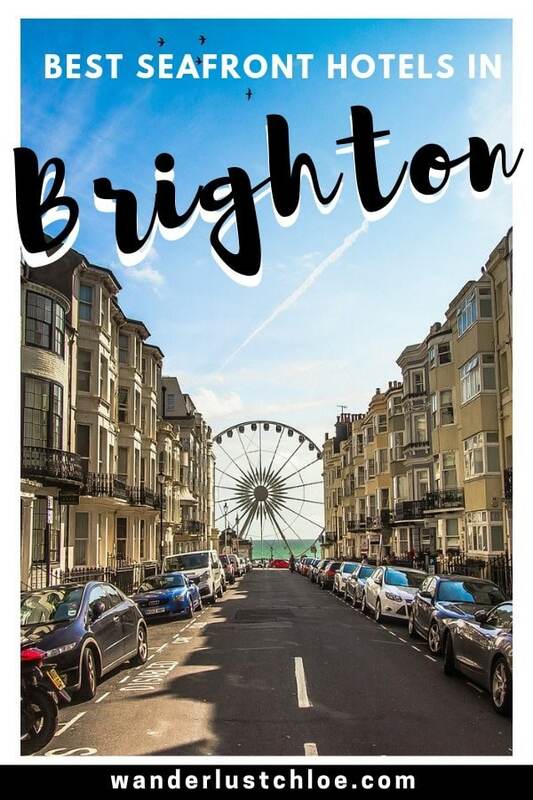 Home to a great food scene, lively café culture, pretty architecture, an amazing pebbly beach and lots of great shops too, Brighton is one of my favourite English seaside destinations. While it’s a very easy day trip from London, I’d recommend staying overnight so you can squeeze in some more exploring, and see the contrast between day and night. 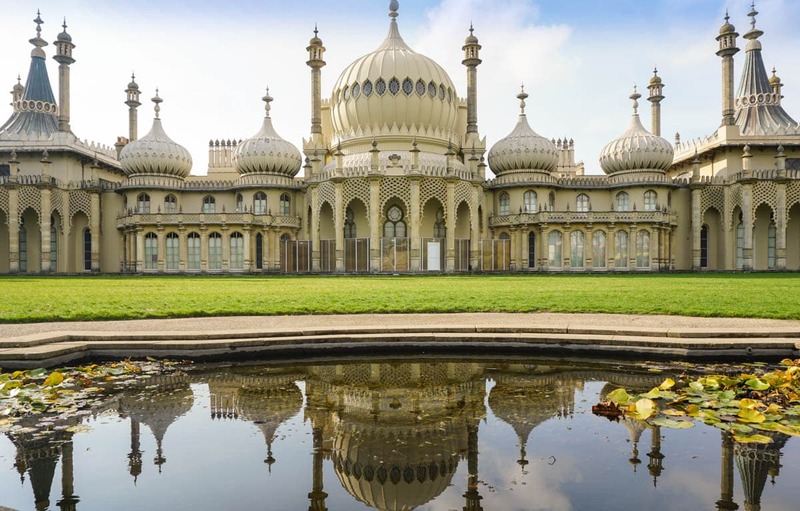 From taking a trip to the top of British Airways i360 and playing games on Brighton Pier, to enjoying the independent shops in The Lanes and admiring the impressive architecture of the Royal Pavilion, there’s SO much to see and do in Brighton. This British seaside resort attracts all ages with long stretches of beach, great restaurants and buzzing nightlife. 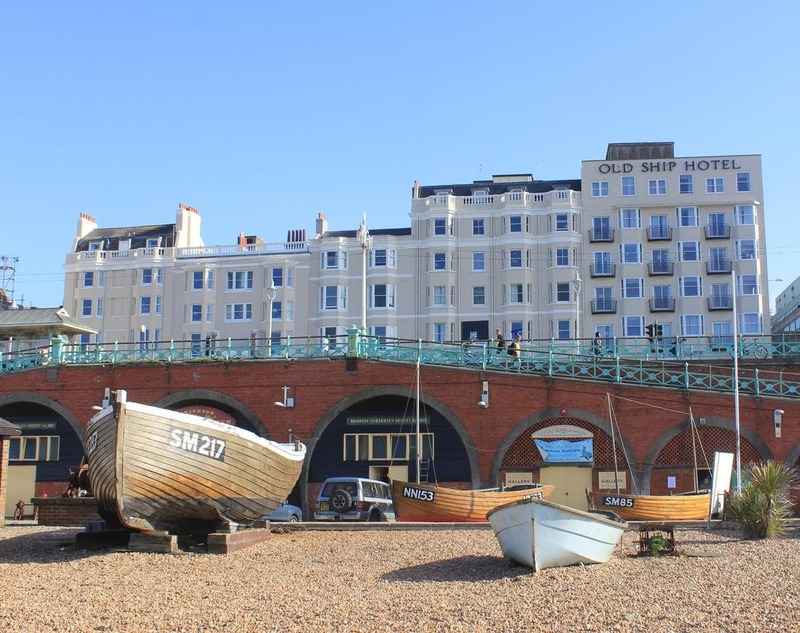 Whether you plan to stay a night, a weekend or longer, there are plenty of great Brighton seafront hotels to choose from. From 5* hotels like The Grand, to charming boutique guesthouses and budget accommodation, here are a few of my favourites to whet your appetite! To help with your planning, don’t forget to have a watch of my video, and check out my post all about the top things to do in Brighton. 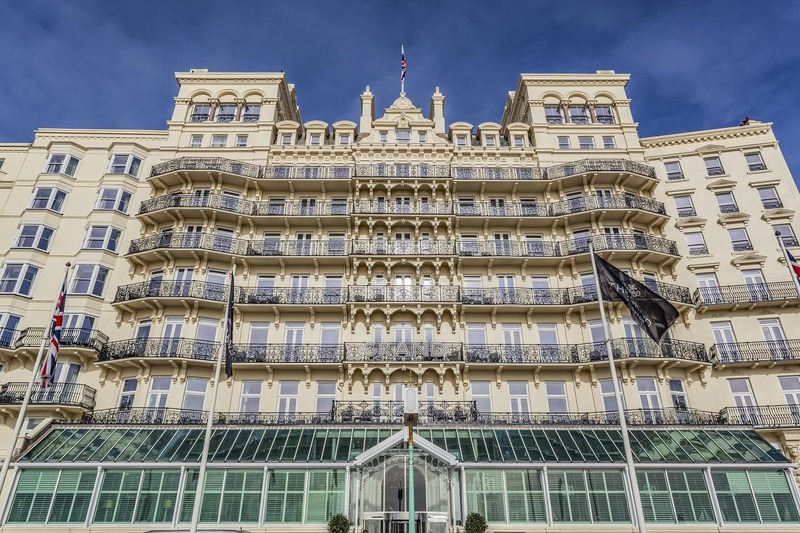 Of all the Brighton seafront hotels, The Grand Brighton is the most iconic. This is the one to book if you’re celebrating a special occasion or fancy splurging on luxury. 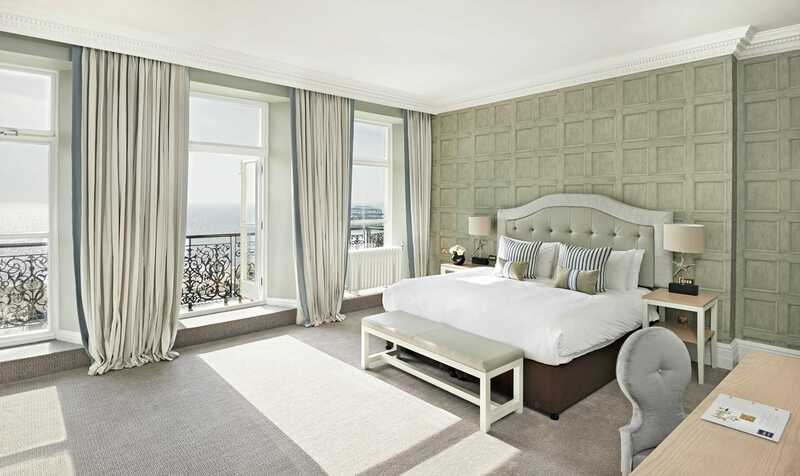 Located on Kings Road close to the shops, the beach, Regency Square and Brighton Pier, this Renaissance-style hotel oozes sophistication and elegance. Rooms are decorated in crisp white linens with muted splashes of colour in soft furnishings. 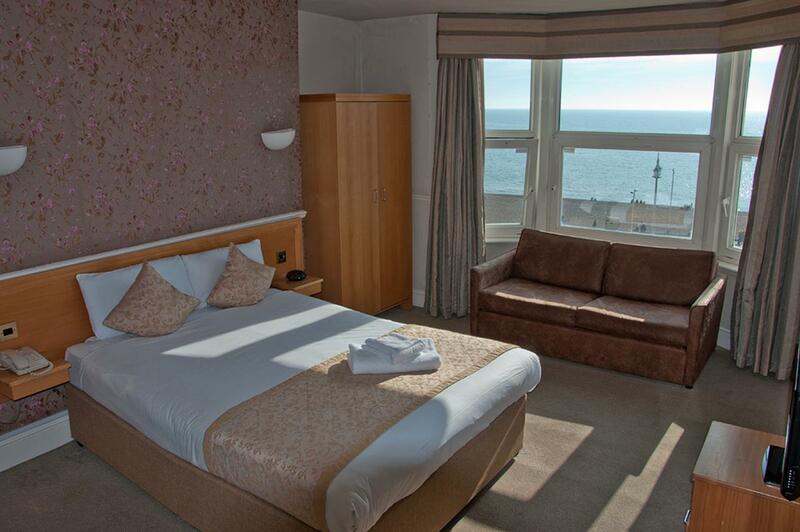 Each room features satellite TV, free WiFi and many have amazing sea views. You can unwind with a massage or facial in the luxurious hotel spa, work out in the gym or relax in the cocktail bar overlooking Brighton Beach. 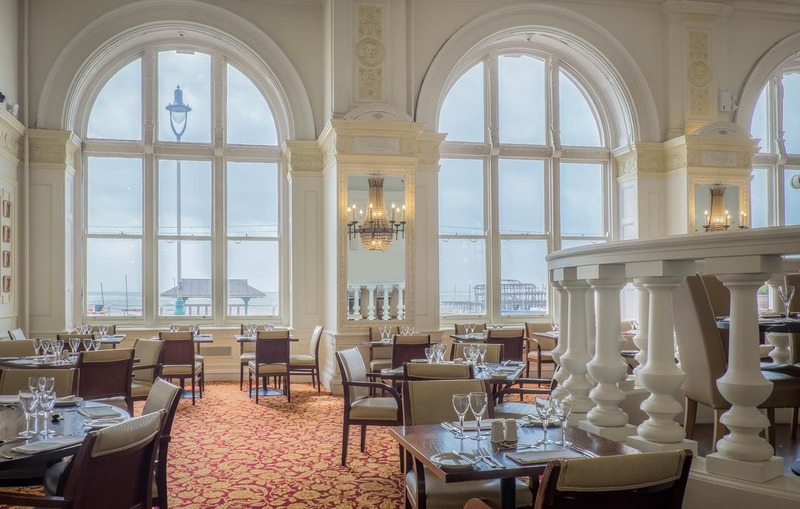 The Grand also has its own restaurant – GB1 which specialises in fresh, locally-caught seafood dishes. 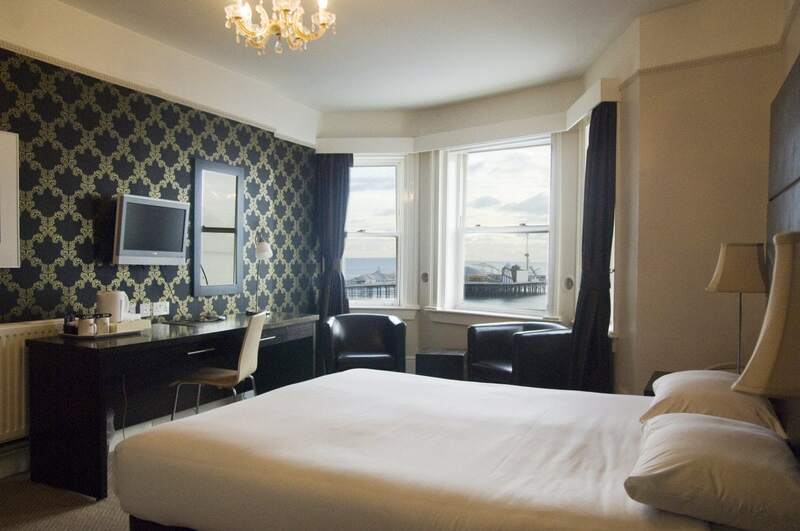 Located on the seafront close to the pier and The Lanes shopping quarter is 3-star Queens Hotel Brighton. It’s in a really handy location for restaurants and just a 5-minute walk from beautiful Brighton Pavilion. The hotel, which overlooks the English Channel, features 94 modern, spacious rooms, with chic decor and incredible sea views. In addition to the hotel rooms, Queens Hotel Brighton also offers 9 refurbished 1-bedroom apartments and 5 studios with kitchens if you prefer self-catered options. These studios and apartments are fully-equipped with Apple TV, Bose Speakers, free WiFi and a coffee machine. The hotel’s restaurant, No. 1 Bar & Bistro serves up a quintessentially English afternoon tea and a modern British menu for dinner. One of the big draws for this hotel is its fab swimming pool! In fact it’s the largest indoor pool in Brighton! There’s also a spa, gym and sauna. With exceptional reviews, stylish rooms and a glorious seafront location, it’s easy to see why visitors love staying at Drakes Hotel. 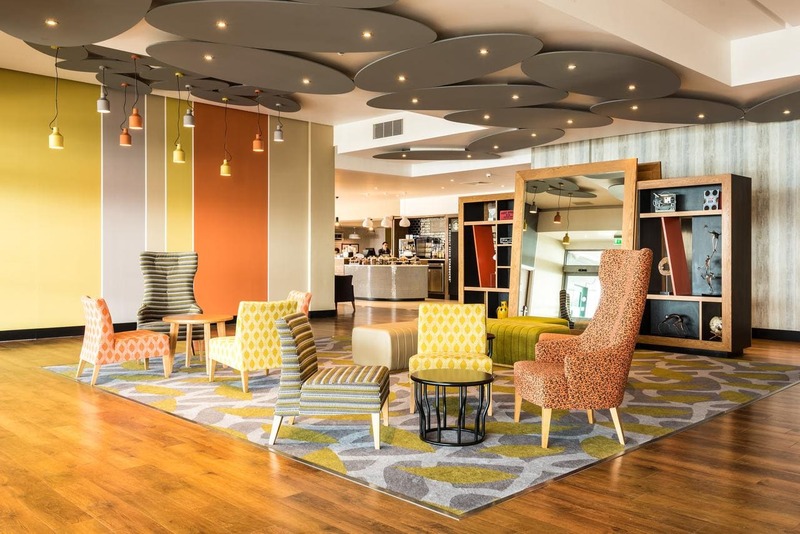 Stylish sorts will love this 4-star luxury hotel in Brighton, with its funky upholstery and decor. 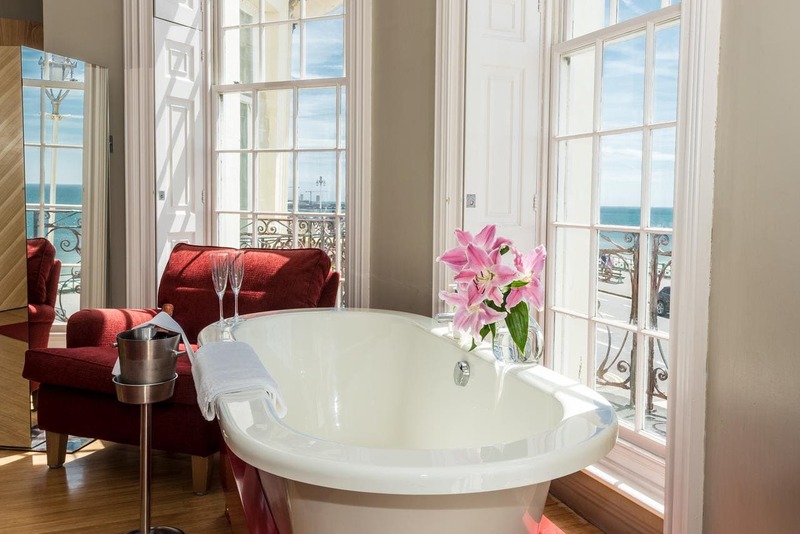 Many of the rooms feature baths right in the bedroom, some with incredible sea views – imagine soaking in the bath while staring out at the dreamy beach views! There’s also an award-winning restaurant on-site and a 24-hour bar – perfect for a nightcap with friends! This is one of my favourite hotel options on Brighton seafront. 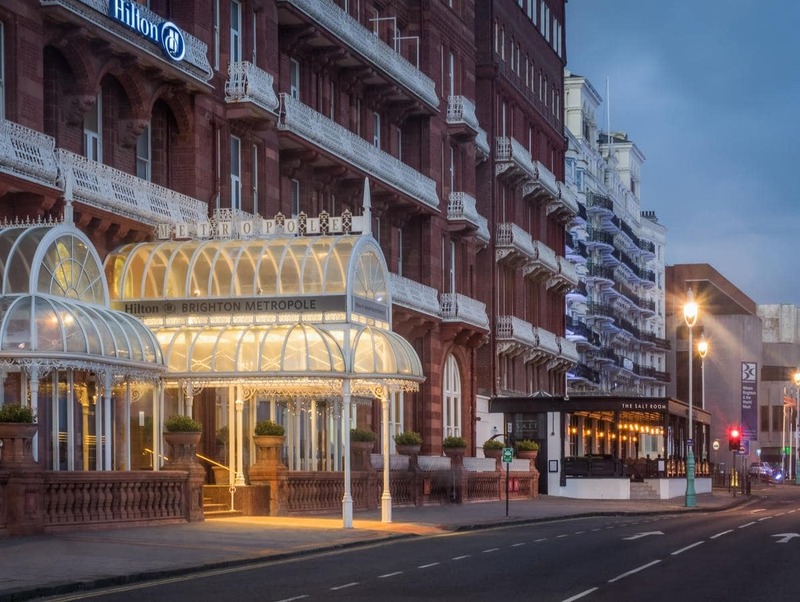 On Brighton beachfront, just a few minutes from the British Airways i360 is the elegant 4-star Hilton Brighton Metropole hotel. 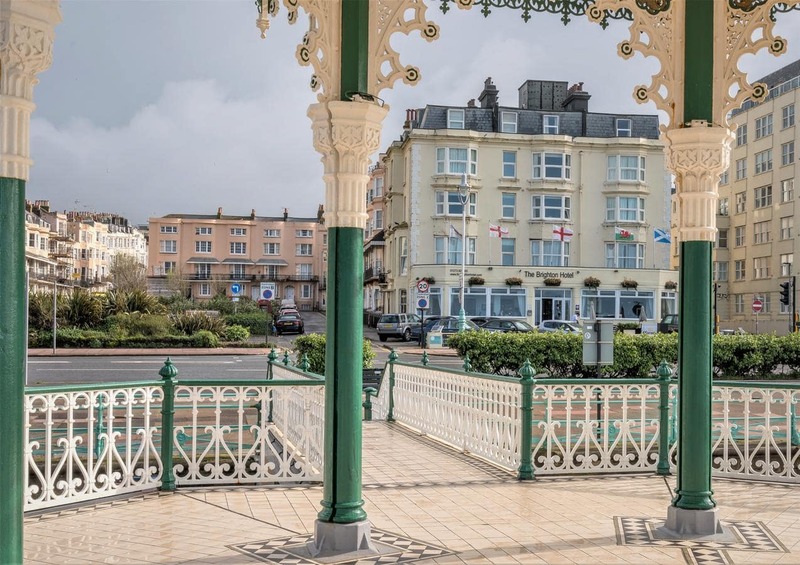 Set in a grand Victorian-era building, it’s perfectly placed for visiting the beach, shops and attractions. 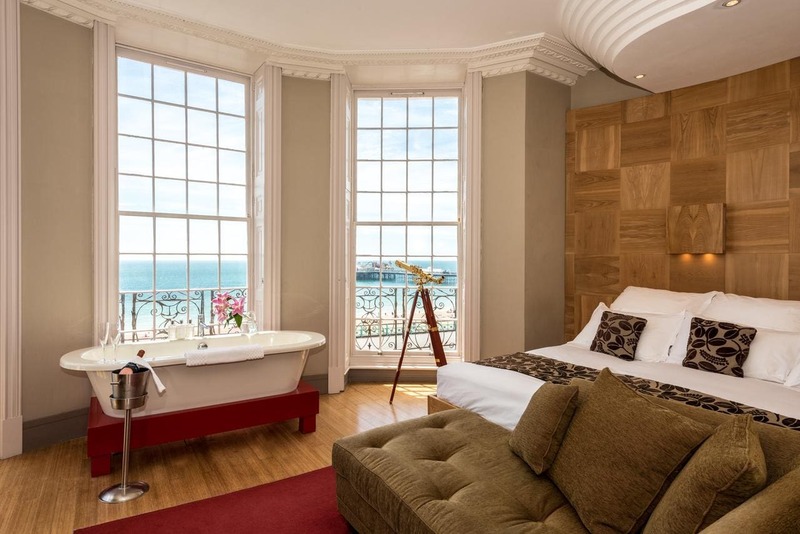 This luxury hotel in Brighton blends its traditional character with chic, modern furnishings, and each room features a flat-screen TV with on-demand movies, stylish décor, WiFi and some even have panoramic sea views! 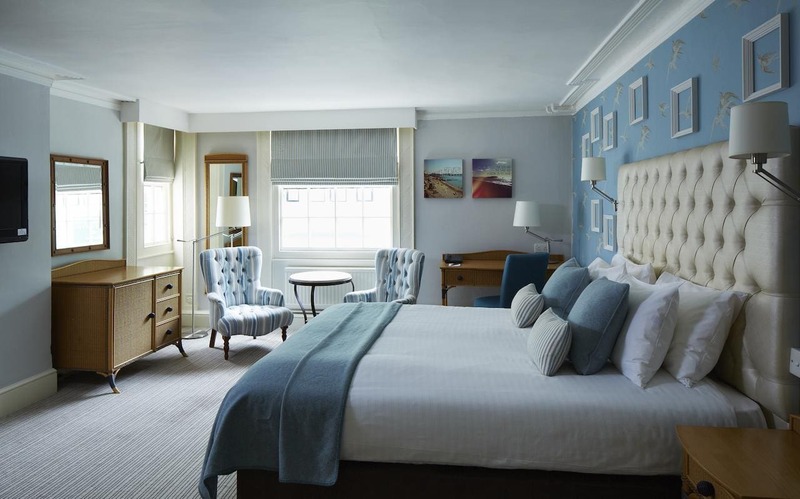 Whether you wish to take an early morning dip in the indoor pool, indulge in spa treatments or enjoy a signature cocktail in the old-world bar, it’s a great hotel for a relaxing stay in Brighton. Guests at the hotel can also experience a choice of dining options ranging from afternoon tea to Jazz lunches and dinner menus featuring European and local cuisine. Jurys Inn Brighton Waterfront hotel is one of the most popular Brighton seafront hotels. 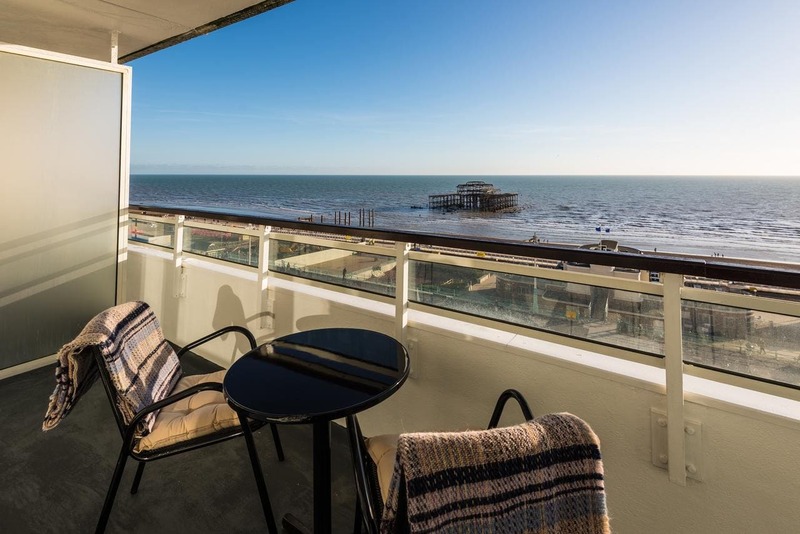 Moments away from Brighton Pier and a short walk from the city’s museums, Brighton Pavilion, The Lanes historic quarter and lively nightlife, it’s ideally placed for a fun-packed break. The 4-star hotel features stylish rooms, plus guests can utilise leisure club facilities including indoor pool and gym free of charge. 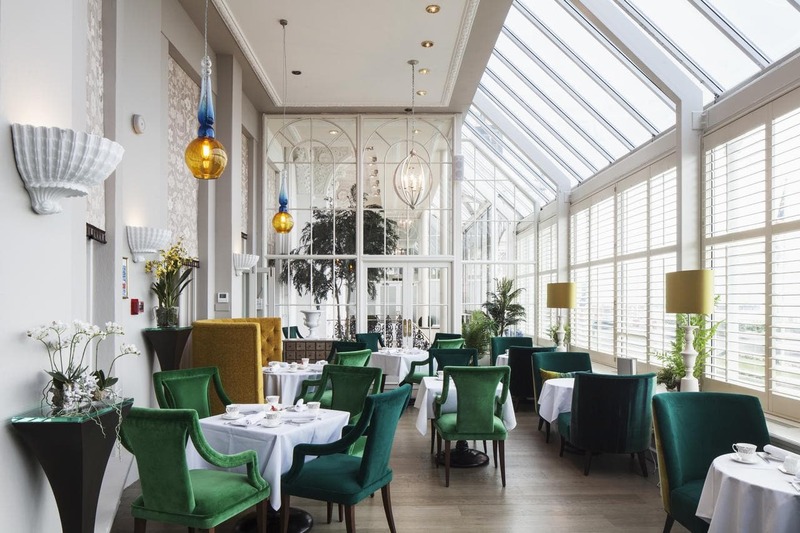 You can enjoy an early evening cocktail in the Atrium Bar with its impressive glass ceiling. 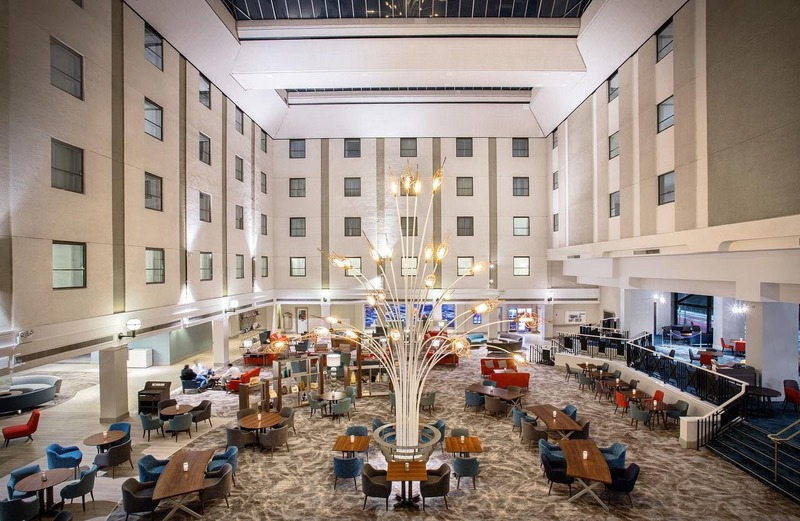 If you’re looking for a hotel which offers easy access to the city centre, with a friendly atmosphere and great reviews, Jurys Inn Brighton Waterfront looks like one of the best options. One of the most characterful Brighton seafront hotels, 4-star luxury hotel The Old Ship Hotel is set in a beautiful Georgian property overlooking the beach. A stone’s throw from Jurys Inn, it’s also within a leisurely stroll of Brighton’s vibrant cafes, top restaurants, independent shops, museums and nightlife. The hotel rooms are spacious and well-appointed, with TV, free WiFi, a work area and some have sea views. It’s a popular location offering easy access to Brighton attractions and neighbouring Hove. Oh and the hotel has a fitness centre, bar and restaurant – everything you need for a relaxed stay. 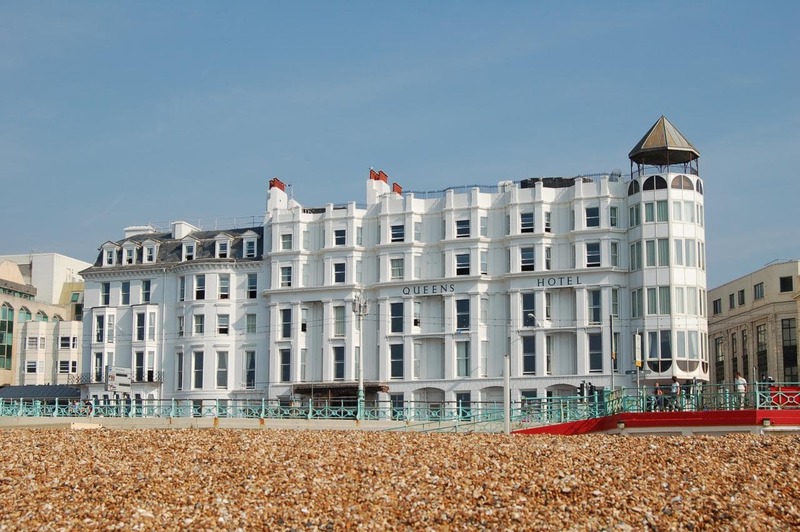 When it comes to reasonably-priced hotels on Brighton seafront, The Brighton Hotel ticks all the boxes. This charming 3-star hotel is near the city’s museums, beaches, shops and the British Airways i360. The hotel is known for its friendly staff, great location, and with elegant interiors which show great attention to detail, it’s no wonder guests return again and again! Some rooms offer sea views, so definitely check what options are available and book one of those if you get the chance! 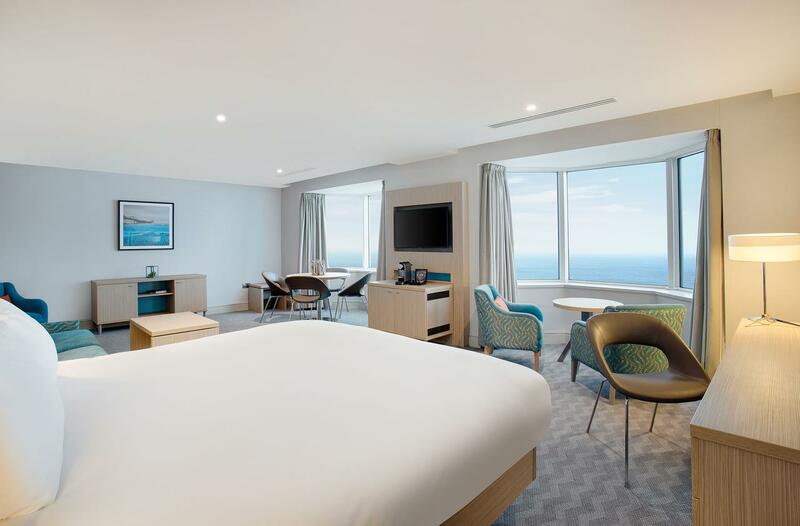 Located on Kings Road, moments from the beach, bandstand and British Airways i360, Holiday Inn Brighton Seafront is one of the most popular mid-range seafront hotels in Brighton. The Holiday Inn boasts a bar, burger restaurant and stylish rooms (some with balconies overlooking the seafront) and 24-hour room service. The interiors are bright and colourful, and there are plenty of communal spaces to relax in. If you’re arriving by car, there’s an on-site car park too, although you will have to pay extra to use it. It’s a pretty ugly hotel, but don’t let that put you off, as it’s very functional and well-located! Not quite found what you’re looking for? You can search on the map to find the perfect Brighton hotel for you! I hope you’ve enjoyed my guide to the best hotels on Brighton seafront! Where would you love to stay? And if you’re still planning your trip – don’t forget to read the top things to do in Brighton. Enjoyed this post? Pin it for later?